Heian Jingu Shrine was built in 1895 to commemorate the 1,100th anniversary of the founding of Japan’s famous capital, Kyoto, which was called Heian-kyo or Peaceful Capital. 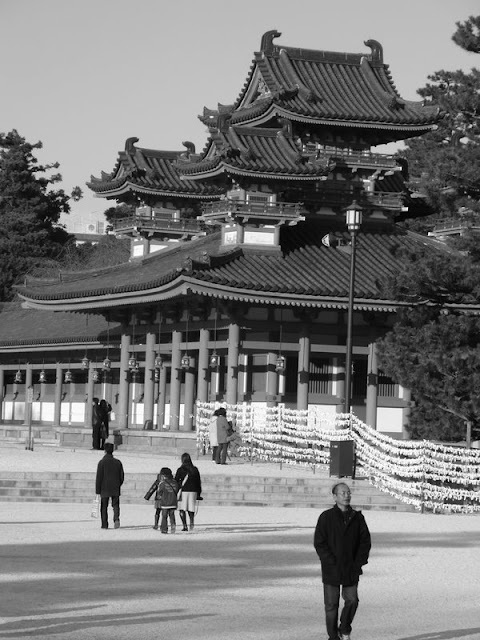 The shrine is the home of two important imperial deities: Emperor Kammu, the emperor who founded Kyoto in 794, and Emperor Komei, the last emperor to rule Japan from Kyoto before the capital was moved to Tokyo in 1867. 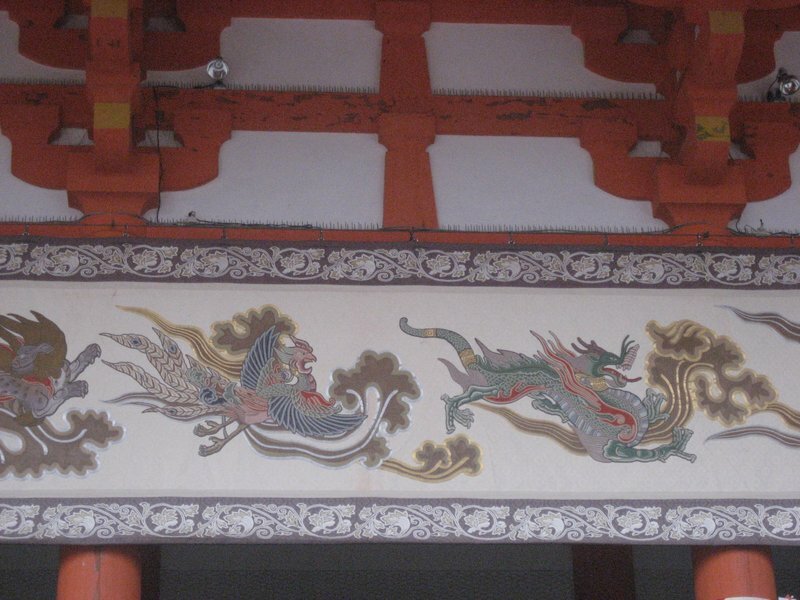 Since it was founded over 100 years ago, the shrine has maintained its majestic appearance and continued to be an important place to worship the spirits of these two important imperial deities that protect and oversee Kyoto. The main building of the shrine is a copy of an early Heian period palace known as Chodo-in, where important national rituals were held. It is the only building in Kyoto that retains the early Heian period architectural style that defined the capital 1,200 years ago. The shrine holds two special festivals every year. The first one on April 15th is quite private and dedicated to the imperial deities of the shrine. The second festival, the Jidai Matsuri Festival (Festival of the Ages), held on October 22nd every year, is, in contrast, very public. October 22nd was the day, over 1,200 years ago, when Emperor Kammu decided to move the capital to Kyoto. From the beginning, the festival was designed as a pageant for the nation, a giant celebration of Kyoto’s people, culture and crafts. It unfolds like a brilliant picture scroll that showcases Kyoto through the ages. All the costumes and accessories used are historically accurate, based on detailed research. Today, the Jidai Matsuri Festival is one of Japan’s biggest festivals, along with the Aoi Matsuri in spring, and the Gion Matsuri in summer. The Jidai Matsuri Festival is organized by Heian-kosha, a group of Kyoto citizens who worship at the shrine. The festival has countless participants and requires great preparation and organization. The parade procession was initially made up of six groups each representing an era from the Heian period (794-1185) to the early Meiji period (1868-1912). Today, there are 18 different groups involving about 2,000 people in a dignified, richly costumed parade of historical figures. The procession begins with the Meiji period and ends in the Heian period (i.e. in reverse historical order). The festival is symbolic of Kyoto, her people, and the city’s great history and culture. ※ The time in ( ) is the estimated arrival time of the head of the procession. For the entire procession to pass a single location takes about 90 minutes. This graceful flag, woven of gold and silver thread, flutters in the festival air, which is filled with the sweet sound of Japanese flutes. The flag is followed by people wearing the costume of the Sangoku-tai, the voluntary army of Sangoku village in Tamba province (now central Kyoto Prefecture). Until 1921, members of the village participated in the festival. Since that time, their role has been taken over by the eighth Heian-kosha group. This procession was added in 1966 to commemorate the centennial anniversary of Emperor Komei. The people in the procession represent the young warriors and noblemen who fought to overthrow the Tokugawa shogunate and restore imperial power. Members of the Kyoto Youth Council play these roles, as they are about the same age as the patriots were. The names above are the main leaders of the patriot movement that tried to overthrow the shogun and restore power to the emperor, specifically to Emperor Komei (enshrined at Heian Jingu Shrine). Katsura Kogoro was a warrior from the province of Choshu (present-day Yamaguchi Prefecture) who studied under Yoshida Shoin and led the overthrow of the Tokugawa shogunate. Saigo Kichinosuke (later named Takamori) from the province of Satsuma (present-day Kagoshima Prefecture) was chosen by Shimazu Nariakira to conclude the alliance between the Satsuma and Choshu clans. He was later named one of the Great Three People of the Meiji Restoration, along with Katsura Kogoro and Okubo Toshimichi. Sakamoto Ryoma played an important role in brokering the Satsuma-Choshu alliance and had great hopes for the new government. He was tragically killed in Kyoto in a sudden swordfight after he had achieved his goal of overthrowing the shogun. Takasugi Shinsaku was from Choshu and also one of Yoshida Shoin’s leading disciples. He too died fighting for the cause he believed in. Sanjo Sanetomi and other radical noblemen, cooperating with the radical samurai from Choshu, Satsuma and elsewhere, also tried to overthrow the Tokugawa shogunate and restore the emperor to power. Near the end, they were disgraced when they lost a key political struggle with the moderates of the new government. They fled to the province of Choshu one rainy night protected by leading Choshu samurai like Maki Izumi and Kusaka Genzui. This event was subsequently called the Shichikyo-ochi (The Fleeing of the Seven Noblemen). The procession highlights the distinctive clothing style of these noblemen. Yoshimura Torataro unsuccessfully led his army against shogunate forces in 1863. Rai Mikisaburo was the youngest son of Rai Sanyo, whose writings inspired many of the radical patriots to overthrow the shogunate. Umeda Unpin was a Confucian scholar. Hashimoto Sanai specialized in Dutch studies. Yoshida Shoin founded a school that produced many great men of the Meiji Restoration. All of these men were terribly persecuted by the top policeman of the shogunate in Kyoto, Ii Naosuke. The noblemen Konoe Tadahiro and Sanjo Sanetsumu were released when they swore to become Buddhist. Anegakoji Kintomo was assassinated by someone near the Imperial palace. The nobleman, Nakayama Tadayasu, together with Iwakura Tomomi, tried to unite the imperial court and shogunate. Hirano Kuniomi raised an army against the shogunate and was later executed. In the Edo period, the Tokugawa shogunate regularly sent its closest feudal lords as representatives of the shogun to Kyoto to take part in key ritual ceremonies. In those times, the procession consisted of up to 1,700 people. It was much larger and more formal than ordinary feudal processions. Today, the procession has been simplified, but it is still the largest one in the festival. The splendid costumes, accessories and palanquins of that era are an extraordinary sight. This is a procession of celebrated Edo period women. Princess Kazunomiya is the younger sister of Emperor Komei who is deified at Heian Jingu Shrine. She was married to the 14th Tokugawa Shogun, Iemochi, as a way to unite the imperial court and the shogunate. In the procession the person playing her role is wearing the imperial style of clothing she wore before getting married when she was around 16 years old. She is accompanied by female attendants. Otagaki Rengetsu was a famous Japanese poetess and her clothing in the procession is what she wore when she was a very young woman. In the Okinagusa, a historical record, it says that the wife of Nakamura Kuranosuke, amassed great riches in the Kyoto Ginza, and that she was exceptionally beautiful. Gyokuran was the grandchild of Kaji, a great poetess, and also the wife of Ikeno Taiga, founder of Nanshu-ga Chinese painting school in Japan. Kaji is known for her excellent poetry. Kaji’s rather simple costume in the procession is what she wore when she opened her tea shop in Gion. Yoshino-tayu was a famous geiko who later became the wife of the powerful merchant, Haiya Shoeki. 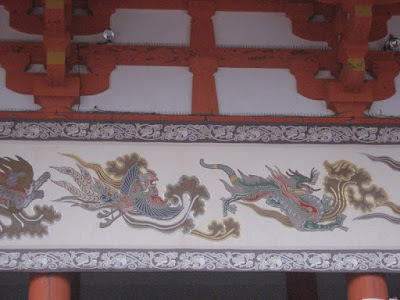 Izumo-no Okuni was a celebrated shrine maiden at Izumo Shrine in Shimane Prefecture. She is said to have founded the earliest form of kabuki theater drama, based on nenbutsu odori, in downtown Kyoto. This costume is what she wore when she was traveling. Toyotomi Hideyoshi (one of Japan’s greatest warlords and founder of Osaka Castle) and his family visited the emperor in Kyoto several times. They rode in an exclusive ox cart decorated with colorful accessories, such as bamboo blinds (misu). The horses in the procession have special saddles that are decorated with lacquer pictures (makie) from China. In 1568, the great warlord Oda Nobunaga was requested by Emperor Ogimachi to end nearly 100 years of civil war. The festival procession costumes copy those worn by Tateri Munetsugu and his party, who welcomed Nobunaga at Kyoto’s Awataguchi gate. The warrior’s armor is of a very new type due to the introduction of guns to Japan by the Portuguese. Some members of the procession have surprisingly showy helmets or prominent clan signs on their horses. Kusunoki Masashige is one of Japan’s most famous and bravest samurai. He sided with Emperor Godaigo, who was exiled Oki Island (present-day Shimane Prefecture) for failing to overthrow the Kamakura shogunate (1185-1333). When the Godaigo returned to Kyoto, Kusunoki, his family and a large entourage, welcomed the emperor in Hyogo Prefecture (west of Kyoto). The samurai in the procession are mostly wearing armor with wide stomach bands and forms of armor that were popular between the mid Heian to the Kamakura periods. Kusunoki wears a gorgeous outfit of armor featuring the Hyogo Kusari-dachi, a special sword with a chain, and a sheath made of leopard skin. The medieval period in Japanese history roughly extends from the late Heian period to the end of the Momoyama period. Historically famous ladies and farm village worker groups, like the Ohara-me and Katsura-me, form this procession. The Ohara-me, from the village of Ohara (northeast of the city), sold firewood or charcoal in Kyoto. They are in late Muromachi period costume. The Katsura-me, from Katsura, came to Kyoto to sell river fish (ayu) and candy. In the procession, they are wearing a unique turban-like head cloth called a katsura-zutsumi. Yodo-gimi, who wears a gorgeous Momoyama period kimono, is the famous mistress of super warlord Toyotomi Hideyoshi. The wife of Fujiwara-no Tameie wrote the famous diary called the Izayoi-nikki. Shizuka-gozen was a mistress of Minamoto-no Yoshitsune, the legendary warrior and brother of the first Kamakura Shogun. She is wearing a shirabyoshi costume worn by female dancers playing male roles. The Yabusame is a traditional skill involving a samurai shooting an arrow at a target while riding a horse at full speed. It is both a samurai training technique and a form of sport. This procession is based on the archers in an army headed by ex-emperor Gotoba in May 1221. He gathered as many as 1,700 samurai at Jonan Imperial villa (from which the procession gets its name). There are five groups of archers wearing ayai-gasa (a straw hat with a wide brim), hitatare (a typical samurai top made with fine textiles), and mukabaki (long, pleated Japanese trousers). This procession was designed to reflect the Fujiwara regents most influential period. The family was both noble and samurai and the costumes in the procession show this. Some wear the costume of a noble government officer visiting the court and others a military officer’s summer costume. They are followed by a number of attendants who give the procession its lively atmosphere. Tomoe-gozen was a mistress of Kiso Yoshinaka, an important late Heian period samurai. She was very brave and exceptionally skilled at martial arts. Yokobue is written about in the famous historical record, the Heike-monogatari (written between 1219 and 1243), as a heroine of tragic love. Her distinctive large bamboo hat is called an ichime-gasa. Tokiwa-gozen was a wife of Minamoto-no Yoshitomo, head of the powerful Genji clan. Sei-shonagon is one of the most famous women of the Heian period. She wrote the essay, Makura-no Soshi, around 1,000. In the procession, she is wearing a formal imperial kimono called a juni-hitoe. The author of Genji-monogatari, the world’s first narrative novel, Murasaki-shikibu, wears a rather simple kimono called a ko-uchigi. The daughter of Kino Tsurayuki, a famous court poet, is written about in Oshukubai, a well known Heian period story. In the procession, she wears a simple, everyday kimono worn by unmarried young women in the mid 10th century. Ono-no Komachi was a famous poetess who served Emperor Ninmyo and Montoku in the mid 9th century. Her Chinese effected costume is based on historical things found in Shoso-in Temple in Nara. Wake-no Hiromushi was the older sister of Wake-no Kiyomaro, a nobleman in the Nara period (694-794). In the procession, she is wearing an unusual Chinese-like costume with a fan in her hand. Kudara-o Myoshin was a great-grand daughter of Kudara-o Keifuku, a descendant of the ancient Korean kingdom of Kudara, and also the wife of Fujiwara-no Tsugutada, a powerful court nobleman. Enryaku is the name of an era during which Emperor Kammu ruled. He developed a new political system and suppressed uprisings northeast of Japan. 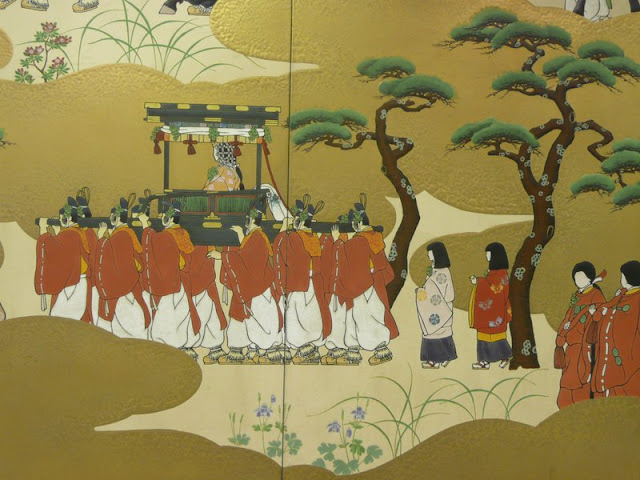 The procession shows the triumphant return of the emperor’s general, Sakanoue-no Tamuramaro, returning from a successful campaign in the northeast. The costumes were based on things found at Shoso-in Temple in Nara or excavated from ancient tombs. This procession recreates an event in 796 when a group of imperial officers visited the imperial court. The formal costumes are called iho. Different colors reflect different levels of rank. Since it was shortly after the Nara period, the costumes are still strongly influenced by Chinese styles. The officer wearing the highest ranking pale purple is called the Sanmi. He is the one who says the prayers at Heian Jingu Shrine in the name of all the festival participants. The Shinsen-kosha are a group of people who dedicate offerings to the deities at Heian Jingu Shrine. At the shrine they follow a Shinto priest and place their offerings in a large wooden box from China (karabitsu). The two top ranking members of the group are on horseback wearing sacred white clothing. They are followed by the other members wearing a simple form of clothing called suikan. This procession, which precedes the palanquins, is made up of noble Onsakaki, who leads the procession, graceful little dancers named Karyobinga and Kocho, and musicians playing the mysterious gagaku court music. This procession forms the main body of the festival. It has two grand wagons, one for Emperor Komei and the other for Emperor Kammu. The spirits of those two deities are said to descend into the wagons, which are then led to Heian Jingu Shrine by Shinto priests in formal clothing. One of the original ideas of the festival was to allow the deities to have a look at the peaceful city of Kyoto and her citizens on the way to the shrine. The Shirakawa-me are women that lived near the head of the Shirakawa River, which runs from the base of Mount Hiei (the massive mountain at the northeastern edge of Kyoto) down the east side of Kyoto. They sold their flowers in central Kyoto, and also at the imperial palace in the Heian period. In the procession they are carrying flowers on their heads and wearing their traditional clothing. The archers are the final group in the overall procession. In ancient times, the finest archers came from Minami-kuwata in the province of Tamba (present-day Kameoka City) and Funai. They served as Emperor Kammu’s guards when he decided to move the capital to Kyoto in the Enryaku period. Nearly 1,100 years later, during the Meiji Restoration period, archers from these same villages fought hard to put down uprisings in northeastern Japan. The members of the procession are voluntary descendants of the original archers. They guard the sacred carriage at the end of the Procession of Sacred Carriages. This clothing was worn by members of the imperial army from the provinces of Satsuma and Choshu. The man on the left is the chief and the one on the right is a musician. This clothing is important in illustrating the transition to modern military uniform designs. Konoe Tadahiro (left) wears a special outfit that only court nobles working for the shogunate were allowed to wear. He is the only one who wears modern formal court clothing with a large sash. Sakamoto (right) is dressed in plain samurai street clothing. The deputies of the Tokugawa Shogun wore hakama, and long, pleated trousers, so that they could easily ride a horse. They also wore a white helmet with the Tokugawa crest on it. The photos below are pieces of equipment actually used in the festival every year. This is the clothing Oda Nobunaga received from the emperor. On the left, he is wearing special protective armor under his upper clothing. His armor illustrates the transition from medieval to modern styles of battle clothing (after guns were introduced to Japan). This costume is worn in the procession by a woman playing the role of Abutsu-ni, a famous nun and writer. She was the wife of Fujiwara-no Tameie, an important nobleman. This costume was the typical clothing worn by female travelers in the middle ages. Yabusame archers require freedom of movement to shoot their arrows from horseback. They wear a short top, called a suikan, and an apron made of deer leather around the lower half of their body. They also wear a special Yabusame helmet. This clothing was worn by fourth rank Fujiwara court nobles who ruled the court army. They wore a special helmet that tightly fits to the head. The distinctive black clothing is suitable for a wide range of movements. On the warrior’s back is a sheath of arrows. Here, Sei-shonagon is wearing a juni-hitoe, the 12-layer kimono worn by the highest ranking court women. This particular kimono (a karaginu) with its long, elegant coat-like appearance was heavily influenced by Chinese styles. This kimono had a great influence on subsequent kimono styles. Here, a warrior is wearing an old form of Chinese armor (keiko) that hangs from the shoulders. This armor was the basis of the bulky armor worn in the Heian period. 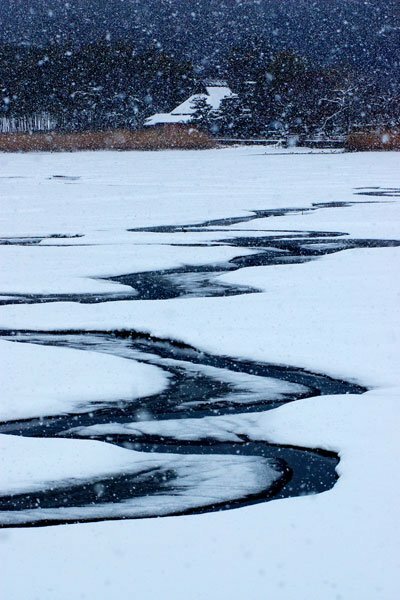 Author: Ian Ropke | Japan travel expert © 2017 Your Japan Private Tours | We design great trips in Japan for any budget everything from unique day tours in the most popular destination zones to digitally guided tours or self-guided tours anywhere in Japan tailored to your preferences.